I LOVE LUCY® LIVE ON STAGE is staged and directed by Rick Sparks and adapted for the stage with new material by Kim Flagg and Rick Sparks. The iconic hit sitcom I LOVE LUCY® originally aired on CBS from 1951 – 1957 for a total of six seasons and 179 episodes and is widely considered to be one of the most popular programs in the history of television. Due in no small part to its relatable characters, sharp comedic writing and Lucille Ball’s signature zany charm, the show continues to endear new audiences with every passing generation. The program was a technical trailblazer, pioneering the multi-camera shooting technique (still employed by the majority of traditional sitcoms to this day) and the use of 35mm film for the capture of a weekly, 30-minute scripted television program (which made possible the re-airing of episodes at a later date, what we now know as “reruns”). In September 2012, I LOVE LUCY® was named the “Best TV Show Of All Time” and the “Greatest TV Comedy” by People Magazine and ABC’s "20/20" special "Best in TV: The Greatest TV Shows of Our Time." I LOVE LUCY® LIVE ON STAGE had its world premiere in Los Angeles at the Greenway Court Theatre from October 2011 – February 2012. A subsequent Chicago production was launched that played two engagements at the Broadway Playhouse, September 2012 – March 2013. The 2013-2014 national tour visited cities including Toronto, Boston, Philadelphia, Nashville and Costa Mesa. 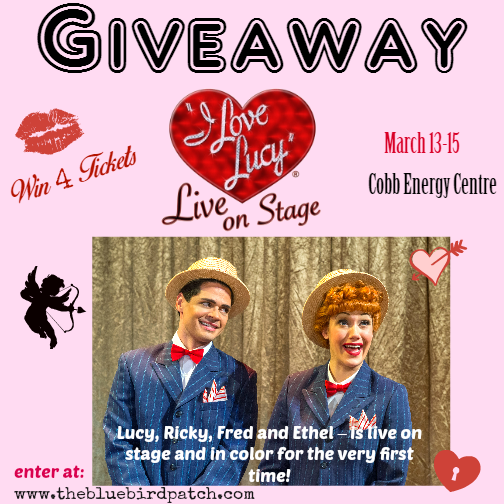 GIVEAWAY: One randomly selected person will win a family 4-pack for the I Love Lucy Live On Stage opening night on March 13. To enter please leave us a comment below and register your entry on our giveaway widget. If you are having problems using the widget please let me know.